I only have a few casters in my character arsenal for DDO, as I tend to favor melee and ranged characters. At least most of the time. Casters just have so many different spells and abilities that it just makes it hard for me, personally, to keep up with. You then layer this on top of the various metamagic feats that you can obtain as you level up and things can get really complicated; trying to remember which metamagics to turn on and which ones to turn off and that type of thing. And then realizing that you left a metamagic feat on and you just cast a spell where it didn’t need to be and noticing how much of your spell point pool you just wasted. I remember when DDO made it possible to “hot link” a metamagic feat to a particular spell. What this allows you to do is to right click on a spell and specify if you want to always have a metamagic feat on or off for that spell (at least for all those metamagic feats the spell can actually use). When this came out, I remember thinking that would be a waste of spell points because if you always leave on empower and maximize then you would wind up burning through spell points after the first couple of fights. I always felt that micro managing your spell points and your metamagic feats was a better alternative, with only turning those feats on as needed. However, I found myself forgetting to turn off some metamagics (such as quicken and extend) when I didn’t need them and not having time to turn on others when I did need them. So instead of micro managing those spell points I found myself wasting more spell points or losing effectiveness in my spell casting. 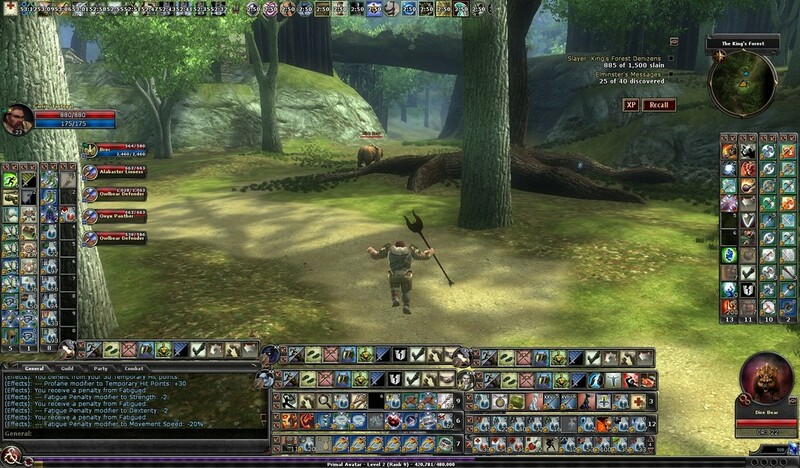 A few weeks back, the DDOCast episode 461 looked at tips for formatting and handling the user interface for DDO. One of the topics they discussed was hot linking your metamagic feats to your various spells. As I mentioned before, although I knew it was possible, I kind of dismissed it but after listening to the DDOCast episode I figured I would give it out a try. I discovered that hot linking the metamagics actually seems to work better for my play style. For spells such as Haste, Displacement, and Rage I find myself not forgetting to extend them and realizing that I didn’t extend the length for spells such as Freedom of Movement or Blur which I don’t typically want to extend (as they tend to last long enough for my needs from a normal cast). For my damage dealing spells, hot linking empower and maximize just allows me to not worry about it layer. So now I don’t have to worry about turning those metamagic feats on when I get to boss fight or a particular tough encounter. Rimuldar setting up his metamagics. The one thing I’m still learning though is too effectively judge what spells to cast as my opponent’s hits points are dwindling down. I do find myself sometimes wasting some spell points because the damage dealing spell I just let fly resulted in much more damage than what was needed to finish the enemy off. However, I tend to melee and range attack much more often with my casters than normal players, as well as using wands, so I believe I will be able to through a better mixture of when to cast my spells and augment them with other forms of attack. This is a learning curve I’m still practicing. In any case, I just wanted to point out that hot linking is a useful too and it is something worth exploring if you play a caster (whether it is an arcane or divine caster). Thanks for reading everybody and happy hunting!! This past week, I had a rather tough time in a number of questing activities this week. Not only did a suffer a rather large number of defeats and I also had a computer crash, go figure!! However, with that said, I still had a good time. I kicked things off on Sunday by taking Erdrique (Level 11 Bard) and Sttollen (Level 12 Rogue) into the Anniversary Party. Since Sttollen is level 12, I entered the Anniversary Party at level 12 and made my way through the quest with little difficulty. I complete the four optional objectives and received five party favors of the run. That was the only quest I completed on Sunday. Getting stunned by Steelstar in the Anniversary Party. On Monday, I dual boxed with Lorrikk (Level 13 Monk) and Stoorage (Level 15 Fighter) and took them into the Red Fens. For a little awhile now, I have been running through slayer areas on Monday because I’m also playing with a digital table top game with a small set of friends and sometimes my attention gets diverted for a large amount of time. By running an explorer area, I don’t worry about not completing a quest. During these runs through the Red Fens, Lorrikk collected 429 slayers and Stoorage collected 515 slayers. Lorrikk picked up four monster manual deeds during this run. He picked up mudman exterminator I and picked up 1,130 experience, sahaugin exterminator II for 1,320 experience, mudman exterminator III for my VIP account, and monstrous plant exterminator II for my VIP account. Lorrikk hit the 750 slayer mark while Stoorage hit the 3,000 slayer mark. They also took out Anogoreth (three times), Chokebriar (twice), Crooktooth (twice), Mudfoot (twice), Kar Xyr, Sharkbiter, Vyx Ka (twice), Gorger (twice), Fencreeper, Riptide, and Nab Ren. Lorrikk making his way through the Red Fens. I logged on with Berann (Level 10 Barbarian) to kick things off on Tuesday and took him into Tangleroot Gorge for some quick slayers. While out there, he collected his last 21 slayers and finished off the zone. He also came across and defeated Clamor and Silkweave. Now he gets to move to Three Barrel Cove. I then logged on with Erdrique and Sttollen and I took them into Sorrowdusd Isle to run The Temple Outpost: Captives of the Cult. However, when I got to the quest entrance my computer crashed. By the time I got it back up and running, I ran out of time for that run. However, I did pick up another 26 slayers for both of them and defeated Noozer before my computer died. Later that night, I logged on with Garrrin (Level 23 Barabarian/Primal Avatar) and I took him into the Underdark to attempt In the Belly of the Beast. On his way to the quest, I picked up 20 slayers and defeated one Dun’robar Blademaster. Once I made it to the quest I entered on epic hard and quickly regretted it. I didn’t have any problems until I got into the arena. Once inside the arena, I started to suffer quite a bit from lag. I didn’t take long for my hirelings to die under the spawns of yuan-ti with me following shortly later. Up to that point, I was suffering lag quite a bit so I was worried something bad would happen. I recalled and made my way back to the quest but entered it on epic normal instead. Things went much smoother this time. Even with the lag, I had little difficulty with completing it. Garrin picked up three monster manual deeds during the completion of In the Belly of the Beast: yuan-ti hunter (2,300 experience), purple worm hunter (2,300 experience), and purple worm hunter II (4,000 experience). He completed the optional objective for slaying Voltane the Slave Master and picked up two commendations, one for war wizard and one for purple dragon knight. He also received 11 commendations of valor as a request reward. That closed out my runs on Tuesday. Berann finishing up the Tangleroot Gorge explorer area. Garrrin traveling through the Underdark to get to quest In the Belly of the Beast. Garrrin making his way to the arena. On Wednesday, I logged on with Garrrin once again but this time for a slayer run through the King’s Forest. He gathered 55 slayers, of which 3 were dire bears and one was a drow priestess. He also completed the random encounter for Money or Life. He also mind one more message from Eliminster. Unfortunately that was the only run I was able to get in. Garrrin hunting in the King’s Forest. 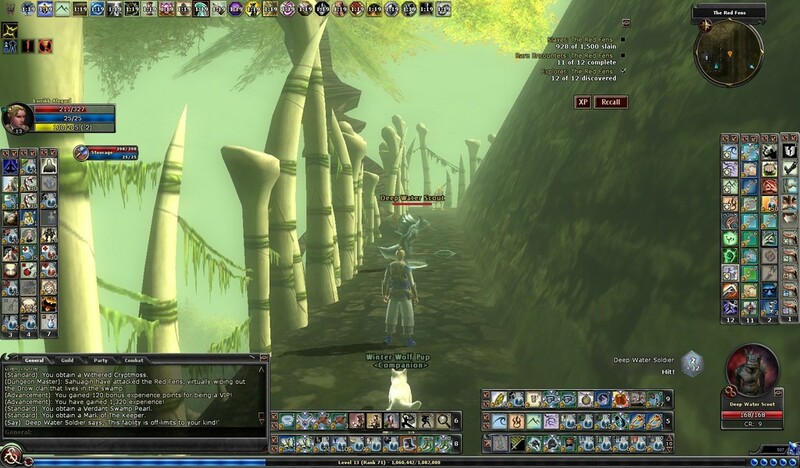 I logged on with Cannock (Level 8 Druid) on Thursday and took him through Tangleroot Gorge. He picked up 109 slayers and came across Silkweave, Clamor, and Gharjat. After that run, I logged on with Hamllin (Level 20 Fighter/Fatesinger) and I took him the Anniversary Party at level 20. This turned out to be a mistake :(. It was painfully evident that Hamllin is nowhere near as prepared as Edrique and he suffered some humiliating defeats. Well after that embarrassment, I logged on with the Cantlin (Level 14 Sorcerer) and Suppply (Level 11 Paladin) and I took them into Tomb of the Shadow Guard on elite. Cantlin picked up a monster manual deed for spider hunter and received 1,356 experience. After that run I called it a night. Cannock hunting down some enemies in Tangleroot Gorge. Cantlin swimming his way through the Tomb of the Shadow Guard. I didn’t log in on Friday, primarily because my wife and I went out to eat, and then I fell asleep, completely missing that play time. 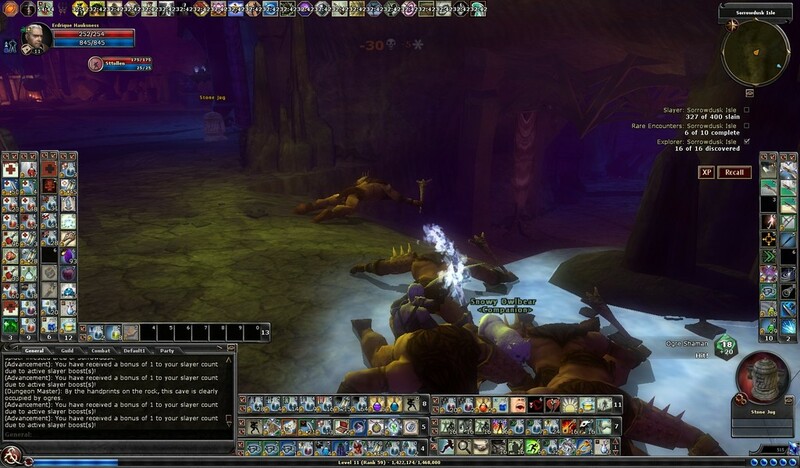 But on Saturday, I logged on with Erdrique and Sttollen and I took them into Sorrowdusk Isle for some slayers. They picked up 146 kills and defeated Saate, Furley, Noozer, Barxer, Kurmer, and hit the 400 slayer mark. I then ran it again later that night and picked up another 148 kills and defeated Saate, Furley, Barxer, Kurmer, and Kremen. Erdrique also picked up the monster manual deed for scorpion exterimantor II and collected another 1,650 experience. I then headed off to the Anniversary Party once again and had no issues completing. Erdrique actually picked up a +1 to +2 Skill Tome (balance I believe) from the end chest. I ran the quest on level 12 again which gave us five more party favors. I then called it a night. Erdrique fighting the ogres in Sorrowdusk Isle. The ultimate ogre slayer in Sorrowdusk Isle. Erdrique taking on Steelstar in the Anniversary Party. So yeah, it was a relatively rough week. Having my computer crash, over sleeping, and then hitting a few rough gaming sessions but the questing was still fun and that is all that matters. I hope everybody else had a great week!! Thanks for reading and happy hunting in Stomreach!! I meant to write about the Anniversary Party last year when it first debuted but I simply just didn’t get the chance to. Needless to say, I was happy to hear that the developers decided to bring the Anniversary Party back, with some slight updates. 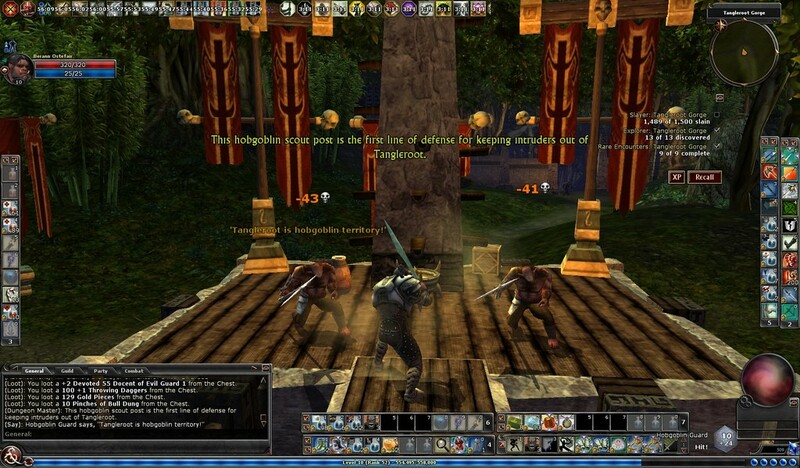 The Anniversary Party is a challenge style quest that celebrates DDO’s birthday outside of the game and celebrates of founding of Stormreach within game. It is located in House Phiarlan (like you would have a large celebrator bash anywhere else in Stormreach!!). The quest itself takes place in a reformatted version of Partycrashers. When you select what level you want to run the quest at, you immediately go to the ballroom where you find Scrag frantically trying to get your attention. You learn from Scrag that a strange overlord has appeared that has rallied the kobolds of Stormreach to revolt against its citizens. As a result, they have tried to “crash” the party and to cause mayhem. Harbormaster Zin is currently guarding the way to the Chapterhouse where the kobolds are currently causing problems. After talking to Scrag, and on your way to discuss things with Harbormaster Zin, you get the opportunity to explore the celebration hall. In the hall you will find just about every notable NPC in the game. You will note the dragons of Argonnesson sitting at a table in elf form (including Velah and the Truthful one, who is actually sitting at the table as a lich) discussing the prophecy, the various Coin Lords strutting about, and even some familiar adventurers. You will also learn, when talking to some of the party goers, that some “developers” are lurking in some areas of the hall. 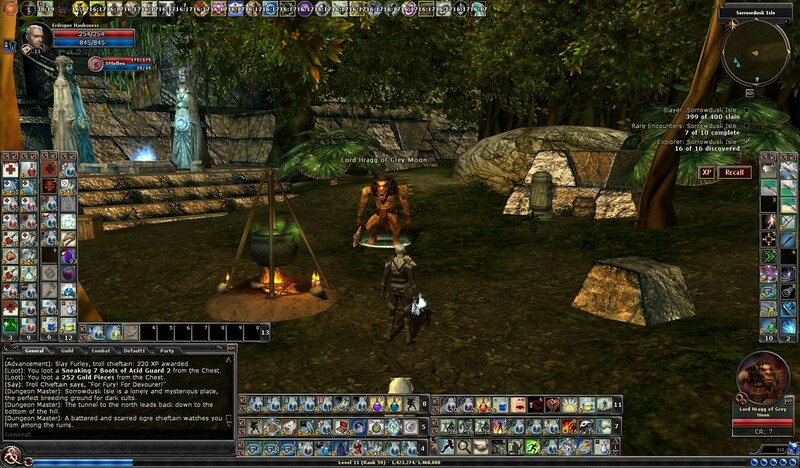 The various DDO developers and personalities (past and present) make various cameos in the quest, with many of them being fun enemies to battle against. In fact defeating four of them are optional objectives for the quest: Severlin, Cordovan, Steelstar, and Vargouille. Severlin is found in one of the upstairs rooms (the art gallery) and is a Purple Dragon Knight. Cordovan is in the side room downstairs and is a cleric. Steelstar is an artificer and is found in the library. And last, Vargouille is found upstairs in the private rooms and is a vargouille (basically a bat with a human head). The other developers that you battle are not optional objectives but still are fun to come across. Erdrique battling Steelstar in the Annivesary Party. After the fun encounters with the developers, you find out from Harbormaster Zin how this mysterious dark overlord has organized the kobolds and some others to create havoc for him and the party. After agreeing to take a look, you get the chance to enter the Chapterhouse where the find the kobolds have taken over and have created various alcoves and mazes. You also see that they have replaced all of the illsionary crystals with those of kobolds. As you make your through the Chapterhouse, you will eventually make your way to the throne room where you find the overlord, to just realize that the dark overlord is no other than Jeets. In fact you might haven noted how he was missing from the party. In any case, Jeets tells you he is fascinated by Malicia and he has gone through this whole scheme just impress her. Upon learning about this, you head back to the party, using the door from the throne room and convince Malicia to help you. You then head back to Jeets, by talking to the same door again, Knockback, and then with Malicia’s help you enter warped mind of Jeets to free him once again from dark thoughts. The primary reward from the quest is obtaining party favors that can then be traded for special items. You also can pick up a number of collectibles as well as a few chests on your way. The quest is quite fun and can be quite challenging. I have found that some of characters just seem to have a tough time in there at level, where others seem to have no problem at all. I hope that development teams continues to bring back the Anniversary Party, with slight updates, like they did this year. In either case, I hope everybody got a chance to check it out. Thanks for reading everybody and happy hunting in the Anniversary Party!! One of the oldest story arcs and set of quests in DDO is the Grey Moon Waning and Cult of the Six quests. The basic premise behind these quests is that a clan of ogres has been betrayed by a small faction of their own tribe with the support of trolls and dark priests who worship the Dark Six. The previous clan leader of the Grey Moon ogres, who reside on Sorrowdusk Isle, is usurped by an evil and brusk ogre named Grust who has given the trolls the ancestral caves of the Grey Moon ogres and has allowed the dark priest to revive the ancient Dark Six temple that resides on Sorrowdusk Isle. Lord Hragg is the rightful clan leader of the Grey Moon ogre tribe. As we make our through the set of quests for these two story arcs we learn that Lord Hragg is a powerful and intelligent being. We also learn that traditional customs and rights are extremely important to him. Although the conversations our characters have with him are brief, we notice how important it is to him for the trolls to be eliminated from the Grey Moon’s caves and how disturbing it is to see the halls in the Temple of Dark Six active once again. His intelligence comes to the service when he demonstrates his ability to read and understand the Libram of the Six, where he learns the rites that the dark disciples in the temple plan to complete and guides you in your quest to stop them. Erdrique meeting Lord Hragg of Grey Moon. One has to wonder though, who is Lord Hragg? How did he become the lord of the Grey Moon clan? How was he betrayed? The only thing we can gleam from our brief conversations with him is that the internal struggle with Grust has left the Grey Moon tribe broken and too weak to deal with the trolls and priest of the Dark Six that are now trying to make Sorrowdusk Isle their home. We don’t learn anything about his past or anything about him accept from our initial perceptions. These holes in our knowledge allows someone like to me to come up with some possible thoughts on these topics. The Eberron Wiki doesn’t give to much insight into the nature or societal structure of the traditional ogre community. However, just knowing the strong tendency for ogres to attach first and ask questions second, I imagine that their society is largely based on a show of force and strength. Based on this thought, I can think of two possible ways in which Lord Hragg became the clan leader of Grey Moon. The first, is through a family history. It is possible that Lord Hragg is an heir to the clan leadership where his family may have been the strongest of the clan. I’m guessing that to maintain this leadership, challenges of combat and strength were issued and defended. I’m guessing these challenges were few and far between. A second possibility is that there is some type or ritualistic performance to determine a clan leader when the previous leader dies or can no longer maintain leadership. I can see the most powerful members of the tribe competing against each other to determine the new clan leader. I can see this as being a possibility, especially one which would have provided somebody like Grust the opportunity to claim leadership and failing therefore resulting in other means to usurp the current leader. Maybe we’ll find out in some future quests in Sorrowdusk Isle or maybe it will always be a mystery. In either case, it is always fun to speculate. Thanks for reading everybody and happy hunting in Sorrowdusk Isle! !